The Toronto Performance Art Collective is pleased to announce the 12th 7a*11d International Festival of Performance Art, taking place from October 2 – 7, 2018 at the Theatre Centre and Sur Gallery. Since 1997, the biennial 7a*11d festival has specialized in offering the kind of absorbing and innovative performance work that you have to be there to fully appreciate. Once again we are proud to bring there here, as we celebrate our 21st year with a roster of 21 amazing artists packed into 6 intensive days of activities. This year’s highlights include progressive and provocative works that give voice to beauty, humour, perseverance and intimacy in the face of human struggle. From the mystery of shadow puppets to the delicacy of private, one-on-one interactions; from spectacular eruptions of queer, dissenting and displaced identities to the epic glory of the everyday made strange; from thoughtful probings of place and history to the joyful and challenging maneuvers of forging new visions of community, 7a*11d promises to excite, engage and inspire local audiences. All talks are free. Performances at the Theatre Centre are either free [(F)NOR, Cindy Mochizuki, François Morelli] or Pay-What-You-Can, tickets available from the Theatre Centre box office 2 hours before the evening or afternoon start time. Suggested minimum donation for performances is $10. All performances are ticketed individually; capacities may vary depending on the room. No unaccompanied minors. Registration required for Cindy Mochizuki’s performance (see details on her artist page). To support access, we invite those within the Deaf, Mad and disability identified communities to register for Barak adé Soleil’s a series of movements [Toronto] via an Eventbrite link. Tickets will be held under your name at the Box office. Tickets are Pay-What-You-Can. You may pay for the tickets at the Box office. Elvira Santamaría’s performance is free. A presentation of some of the artist’s performative video works. A chronicle of Hank Bull’s art partnership with Patrick Ready under the banner of HP, setting their exploits in the context of the history of electricity. A discussion with two established artists who work across disciplines. A lively panel with three remarkable Canadian artists. Every festival, many of our participating artists arrive with a treasure trove of publications, multiples, and other items that come out of or are produced alongside their performance practice. These could be hot-off-the-press items, links to online content, or works and objects that are difficult to circulate outside their own communities. We provide a public forum for the distribution and sale of such works by hosting the “official” Toronto launch of these rare commodities. Come join in a lively celebration and exchange of wares; there may even be a freebie or two! All proceeds go directly to the artists. Participants in this year’s launch include invited artists ARAHMAIANI, Gustaf BROMS, Hank BULL, Erika DEFREITAS, Darisuz FODCZUK, Louise LILIEFELDT, Cindy MOCHIZUKI, François MORELLI, Lala RAŠČIĆ, Elvira SANTAMARÍA, and Sandra VIDA collective members Golboo AMANI, Paul COUILLARD, Johanna HOUSEHOLDER, and Tanya MARS, as well as co-presenter Sur Gallery and long-time ally FADO Performance Art Centre. 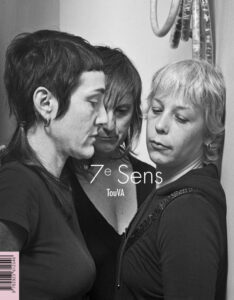 This is also the Toronto launch of 7a*11d alumnae TouVA‘s The 7th Sense: Practicing Dialogues / Practicing Workshops / Practicing the Daily Performative / Practicing Performance Art. Comprised of essays, a glossary, and contributions by 30 contemporary performance artists, The 7th Sense surveys the performative in, with and through language. It explores a vocabulary as a process of articulating what happens before, during and after a performative action, and expressing what is experienced by artist and audience. The TouVA collective presents a series of reflections in relation to their artworks and to the workshops that Sylvie Tourangeau, Victoria Stanton, and Anne Bérubé have taken and facilitated, inviting the emergence and recognition of an increased sensibility in this vibrant and fleeting performative: a 7th Sense. Inaugurated in 2002, the festival’s Éminence Grise designation highlights our commitment to bringing forward a lived history of performance art by presenting the work of key Canadian artists. We celebrate artists who have helped to establish, shape, and embody performance art in Canada. This year we are honoured to feature two pioneering multimedia artists who are known both for their innovative art practices and for their instrumental roles in fostering Canada’s artist-run centres. These are artists who have contributed to the development of a strong international artist network while remaining rooted in distinctly regional cultural communities. Hank BULL is based in Vancouver, and Sandra VIDA is based in Calgary. Click on their artist links for a more in-depth consideration of their practices in their own words. Presented by LACAP (Latin American-Canadian Art Projects) in partnership with 7a*11d. Curator Cecilia Fajardo-Hill discusses her itinerant exhibition, Radical Women: Latin American Art 1960-1985, presented most recently at the Brooklyn Museum in New York. This year, we are doing documentation a bit differently. Rather than providing a textual recap of the previous day’s events on our blog, we have commissioned two writers, Francesco Gagliardi and Geneviève Wallen, to write in-depth post-festival essays. To get the flavour of what is happening on a daily basis, we have invited jes sachse to be our social media respondent, who promises to provide us with a daily feed of digital impressions on Instagram. In addition, our curatorial intern, Shalon T. Webber-Heffernan, will manage daily reminders and live updates on our various other platforms (twitter, Facebook and our web blog). We are honoured to once again have Henry Chan as our festival photographer, and Alan Peng as our videographer (along with Jeff Zhao). Thanks to our ongoing archival efforts, video documentation of this year’s performances will be available online soon after the festival ends. Follow us on twitter @7a11d for live updates on the festival, and remember to hashtag your tweets with #7a11d to share your thoughts and photos with others! Henry CHAN (photographer) has been documenting performance art in Toronto since 2006. He has photographed the activities of FADO Performance Art Centre for the last 12 years, seven of the 7a*11d festivals, as well as events, exhibitions and performances at various arts venues. When he is not using a camera, Henry is crunching numbers and pushing paperwork as an accountant. View a selection of Henry’s photos from the festival on Instagram, chosen by curatorial intern Shalon T. Webber-Heffernan. Francesco GAGLIARDI (writer) is a performance artist, writer, and occasional filmmaker based in Toronto. His performance work has been presented in venues including Issue Project Room (Brooklyn, NY), The Ontological-Hysteric Theater and The Stone (NYC), The Wulf and Pieter (Los Angeles), Esorabako (Tokyo), Fondazione Mudima (Milano), FADO Performance Art Centre, Harbourfront Centre, and 7a*11d (Toronto). His film work—screened in venues including TIFF Wavelengths and Images Festival—was the subject of a retrospective with Peasure Dome in October 2017. He is currently an Assistant Professor CLTA cross-appointed at the Centre for Drama, Theatre, and Performance Studies and the Department of Philosophy, University of Toronto. Read his review RE:FRAMING on our blog. Alan PENG (videographer) is deeply involved with many facets of the Toronto arts community. From producing documentation to collaborating with artists, he has made moving images that have been exhibited at venues such as the The Theatre Centre, Younger Than Beyoncé Gallery, University of Toronto Arts Centre, and the Cedar Ridge Creative Centre. Additionally, Alan is involved with various arts organizations, spanning from the downtown core through to Scarborough, such as The Reel Asian International Film Festival, imagineNATIVE film festival, FADO Performance Art Centre, The Doris McCarthy Gallery, Y+ Contemporary, Scarborough Arts, and of course 7a*11d. jes sachse (social media respondent) is a Toronto-based artist whose work and practice address the negotiation of bodies moving in public/private space and the work of their care. They are often found marrying poetry with large-scale sculptural forms. Their work & writing has appeared in NOW Magazine, The Peak, CV2 -The Canadian Journal of Poetry and Critical Writing, C Magazine, Mobilizing Metaphor: Art, Culture and Disability Activism in Canada, and the 40th Anniversary Edition of Our Bodies, Ourselves. Geneviève WALLEN is a Toronto-based curator and writer interested in issues of ethnocultural representational spaces in Canada. Wallen’s focus on diasporic narratives, intersectional feminism, intergenerational healing, and alternative BIPOC futurities inform her practice. She has curated exhibitions in Montreal and Toronto, and is currently a Programming Coordinator at Xpace Cultural Centre, a board member-curator at YTB (Younger Than Beyoncé) Gallery, and part of the ad hoc collective We Critique, We Curate. Read her review Tender considerations on our blog. Shalon T. WEBBER-HEFFERNAN (curatorial intern) is an emerging curator, writer, and Ph.D. student in the Department of Theatre and Performance Studies at York University. She works at the interstices of performance and/as politics, populism, and embodied practice across borders. Her research and practice examine cross-cultural immersive performance pedagogy as well as contemporary transnational performance art as protest, solidarity, and political act within and across borders—specifically within the context of Canada-USA-México. 7a*11d takes place on the traditional and unceded territory of the Anishinaabe, Mississaugas and Haudenosaunee people in the North Part of Turtle Island, land bound by the Dish with One Spoon covenant. *** Subsequent Indigenous Nations and peoples, settlers, immigrants, refugees, and displaced people have been invited into this treaty in the spirit of peace, friendship and respect. Acknowledging territory is only one step in the necessary work to challenge the legacies of colonialism, and cultivate strong and meaningful relationships with the First Peoples of Canada. ***The Dish With One Spoon is a treaty between the Anishinaabe, Mississaugas and Haudenosaunee that bound them to share the territory and protect the land. The Dish represents what is now southern Ontario, from the Great Lakes to Quebec and from Lake Simcoe into the United States. This covenant tells us that all who share the territory eat out of the same Dish, with only one spoon. We share the responsibility of ensuring the dish is never empty, which includes taking care of the land and the creatures that cohabit it. There are no knives at the table; we must keep the peace.